Before 1830, there was no bridge connecting the Blue Hill Neck, as it is called, or South Blue Hill, with the island or the rest of the Blue Hill community. Therefore the community had to be relatively self-sufficient in providing their own food and shelter. Farming was most likely subsistence farming with each landowner working a plot of ground to grow sufficient fruits and vegetables to take care of his family and perhaps some to sell or share with neighbors. Town meeting minutes indicate that the first permanent bridge to span the Falls was erected in the Fall of 1852. At a Town Meeting in March 1851, Bushrod Hinckley, Arthur Drinkwater, and Reuben G. W. Dodge were appointed to a committee to work with an engineer to identify a good site and estimate the cost of a bridge. At a Town Meeting a year later, town citizens voted to build the bridge and pay the builders $1000 within six months after the Selectmen certified that the completed span was acceptable. The Selectmen so certified in February 1853. The first bridge was a wooden structure and vulnerable to high water and ice. Town records and other accounts indicate that the first bridge was replaced and repaired more than once in the next thirty years. 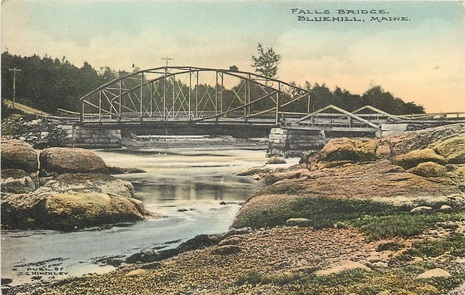 At Town Meetings in March and April 1883, the people of Blue Hill voted “see what should be done” about the Falls bridge and authorized the selectmen to seek estimates for an iron bridge as well as a new wooden structure. 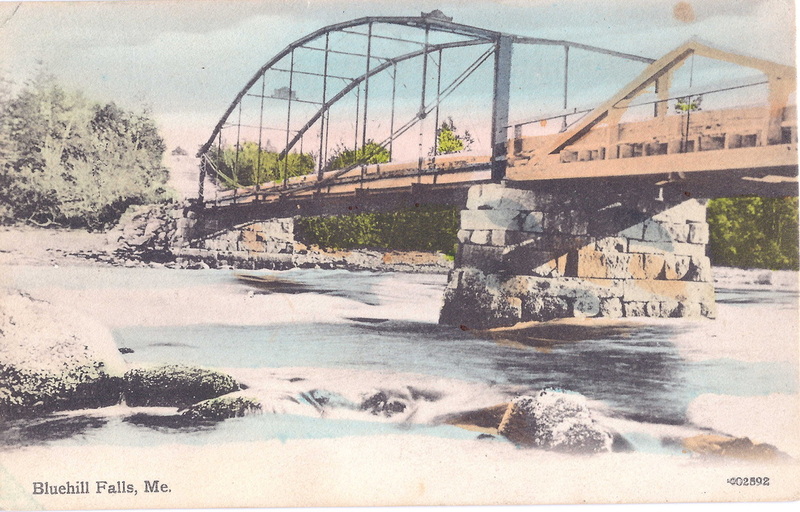 In a Town Meeting that September, the East Berlin Bridge Co. of Connecticut presented an estimate of $1800 for an iron bridge, “the town to furnish the woodwork and take away the old bridge.” Town citizens voted to build the iron bridge and authorized the selectmen to “hire money” to pay for the bridge at the rate of $300/year. 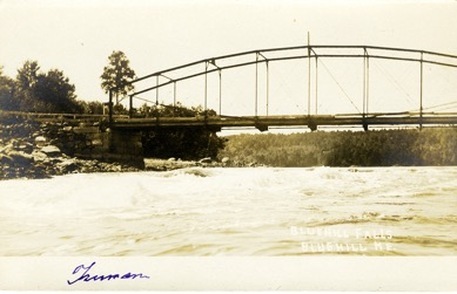 The Iron Bridge across Blue Hill Falls, Built 1883 (From the Blue Hill Historical Society historical postcard collection) The iron bridge was replaced by the current conc﻿rete structure in 1926. 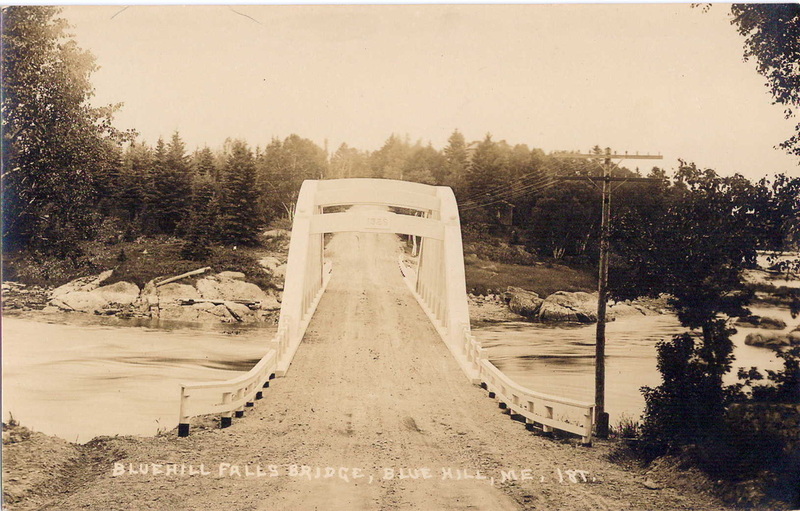 At a Town Meeting that year, citizens voted to build both a new “Falls Bridge” and a new “Tide Mill Bridge” at the other end of Mill Island and to raise the level of Falls Bridge by three feet. The new bridge was named the “Stevens Bridge” in honor of Austin Stevens, one of Blue Hill’s leading selectmen of that era. The graceful arches of the Stevens Bridge are a historical landmark in Blue Hill. With occasional refurbishing by the State, the bridge has survived for 92 years and is scheduled for repair or replacement in 2020 or so. Through their votes at Town Meeting, town citizens have been intimately involved from the beginning in decisions about how and with what to bridge Blue Hill Falls. They may soon be asked to help decide the next step in the history of the Falls Bridge. Town leaders report that Maine DOT has added to its long-range plan a decision to either carry out a major restoration of the current structure or to replace it with a new bridge that would change the character of the landscape around the Falls. What did folks in South Blue Hill do for a living and to support their families? The area around the Neck and the Falls was the first settlement at Blue Hill and was the center of activity until around 1800, when the action moved up to the “head of the bay.” The first meeting house and the first cemetery were in this area, but their exact location is now a mystery. The first town meetings were held in the meeting house there and some of them in Joseph Wood’s house. 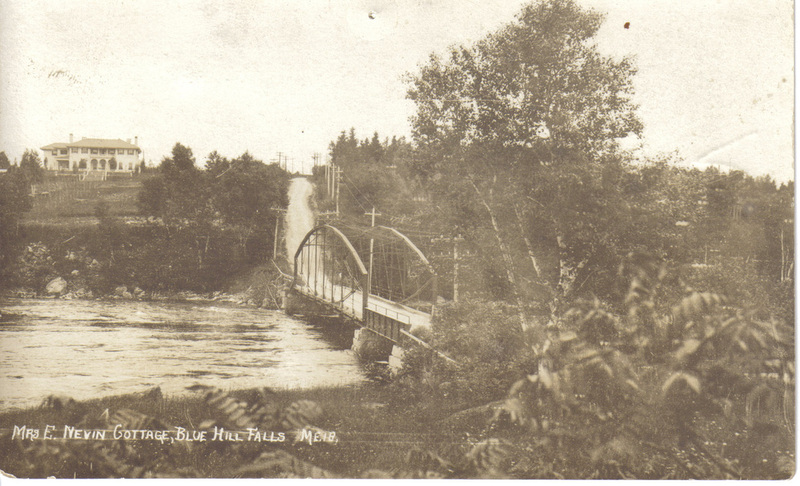 The following images show the 1st iteration of the Iron Bridge over the Blue Hill Falls. All are pre-Arcady. You can identify that this is the older Iron Bridge because when looking at the North Side of the bridge (Mill Island) there is a triangular wood support structure that is the support for the short bridge between the land granite buttress and the granite buttress fully in the stream. In the second version, the wood structure is gone and a short Iron Bridge covers the span - similar in looks to iron railroad bridges over roadways. Today that space is all granite and there are two (2) not three (3) granite buttresses. The second Iron Bridge over Blue Hill Falls is differentiated by the short iron bridge leading to the larger trussed structure in the flow. Arcady can now be seen in some of the photos, as well as construction equipment for the trussed bridge. In some of the photos "telegraph" poles run on the bay side of the photos. In others - the later (circa 1913 or so), when power first came to that part of Blue Hill, those are on the Salt Pond side. Today the power, phone and cable lines run on the pond side. The following photos of the current Blue Hill Falls Bridge, more formally known as the "Stephens Bridge," are divided into two elements. The first is the construction and the second the finished structure. The photos are not in sequential order at this point, but that effort will be made when time allows. It is clear what is construction and what is not though. In two of the photos in the second element - near the end - the structure that was associated with the "chimney" that now sits on the Blue Hill Neck side of the bridge, can be seen. The structure was removed when the road was widened and the dirt road eventually asphalted over.